Where would the followers of Christ begin to think about this year’s general election? I suggest our thinking needs to come out of our discipleship; otherwise we are living a split life. 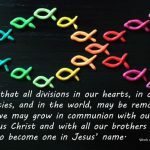 Discipleship involves ‘being of the same mind as Christ Jesus’ (Phil.2:5). He saw in his Father’s love for us what it means for us to become fully human and fully alive. So his prayer – and now ours – was for the Father’s will to be done, on earth as in Heaven. These are linked, because every precious, beautiful and loving moment of our present lives is what we shall ‘find again’ in the next. ‘All the good fruits of human nature, and all the good fruits of human enterprise, we shall find again, cleansed and transfigured.’ (Constitution on the Church in the Modern World, 39.) Carrying out our civic responsibilities has that kind of depth. 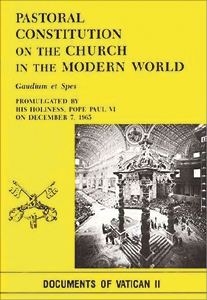 The Vatican Council memorably acknowledged the Church has no blueprint for social, political or economic life. But in chapters two, three and four of its Constitution on the Modern World, it gave us a treasure trove of practical wisdom – concerning how we make the world more truly human. Our political thinking can only benefit by being informed by that wisdom. In this way we also become more qualified to take a hard-nosed look at what is making life less human. We need to recognise the distortions, and feel the pain, which is what Jesus did. What is it that underlies the inequalities, hurts and resentments that agitate people’s lives, and sometimes leads to extreme reactions? Much of the violence and starvation in war-torn countries today is drawn-out reaction to political and economic oppression dating back decades. We cannot undo those histories, but we can learn from them. Much that was wrongly done to other people in the name of ‘pacifying’ and ‘civilising’ was considered ‘normal’, acceptable and even virtuous. On a smaller scale, the dynamics of oppression are the same. 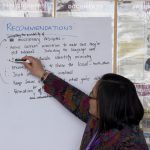 Growing inequalities and rising resentments in our own country can come about because of behaviours that are regarded as ‘normal’ and ‘acceptable’ business and trading practices. For example: the pursuit of bigger profits, salaries and bonuses on the back of other people’s lay-offs; difficult working hours and damage to family life; speculative practices that ratchet up house prices making houses affordable to fewer people (and government denials there is a housing crisis long after economists and the public could see that there is); slowness to address the needs of mental health notwithstanding numerous commissions and recommendations; policies that allow, or fail to halt, the depletion of natural resources, the pollution of air and water, and the destruction of the environment; the making and marketing of munitions and weaponry that others will use to kill and maim and destroy, and so on. 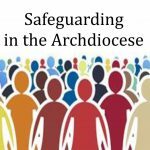 The time to evaluate the ideologies and practices which make life less human, and the time to become familiar with the Church’s social teaching, is long before election day. We need to be involved in the processes that lead to the formation of policies and the selection of candidates. respect the God-given dignity of every person, and sacredness of human life? promote the common good, that is, work for the social and economic conditions needed for individuals and communities to more easily and more fully attain their own fulfillment? These are matters of justice, and they are not uniquely Catholic or Christian. To take on a fully Christian flavour, a further question has to be asked: can those who offer to represent us be trusted to act out of compassion for people – both within and beyond our borders? Compassion comes into this because justice can be achieved only by reaching beyond the limited boundaries of what people have a right to? Compassion goes beyond what is owed, or fair, or even ‘reasonable’. Like God’s love for us, it ‘walks the extra mile’, and like God’s rain, falls on honest and dishonest people alike. But is talk of ‘love’ too soft and out of place in the hard world of people’s real lives and politics? No, it is actually more difficult and demanding than simply looking for someone to blame and hold accountable and punish and put away – which doesn’t work, anyway. When people find they are loved beyond what they have deserved or earned, they begin to see themselves in a new light, and recognise their own dignity. This is what makes new starts possible because it breaks out of the cycle of forever needing to get even. It is the love that ‘changes everything’. Putting it into practice can be a game-changer. 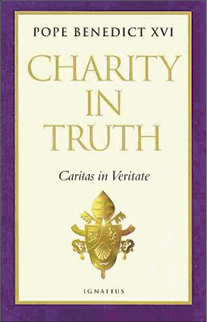 It was also in this vein that Pope Benedict XVI taught the need for ‘gratuitousness’ in social, political and economic life (Veritas in Caritate). Provision for gratuitousness, mercy and compassion exceeds the strict requirements of justice. It is a way of loving that is modeled on God’s self-giving love. It needs to be built into international trading relationships, industrial relationships, laws protecting the rights of corporate bodies, laws protecting intellectual property, and so on. This, too, is a game-changer. Followers of many faiths recognise the need for this radical way of loving; ‘unbelievers’, too, recognise the need to move beyond the kind of world we have, towards a better world. A love for one another based on how God has loved us is not something that should be ‘kept out of politics’. It is what politics needs! If this more radical way of loving – compassion – is what we ourselves are committed to, then we are entitled to look for it in our leaders. They need to know what we expect. Whether we call it participation, or social responsibility, or lay apostolate – yeast in the dough; it involves much more than just casting a vote on election day.